Turtle Tracking with Duke Marine Lab! The Duke University Marine Laboratory in Beaufort, North Carolina is a very busy place! Undergraduates, graduate students, and faculty study a wide variety of topics, everything from marine mammals to toxicology to environmental policy. 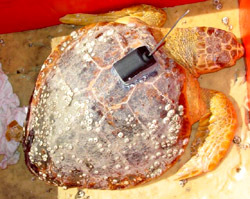 This Signals of Spring partner is sharing location data on two juvenile Loggerhead turtles with students this spring. Both turtles were caught last fall in pound nets, a type of net that fishermen set in shallow waters to trap fish such as flounder, sea trout, and mullet. Scientists have many questions about what the turtles are doing when we can’t see them—where do they go? What are they doing? 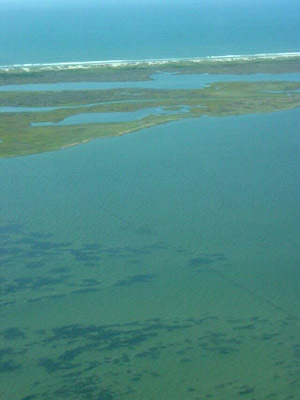 How are they using coastal habitats? When do they migrate? What routes do they take? Where do they spend the winter? 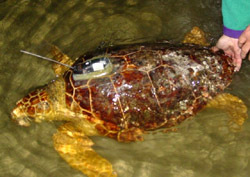 By attaching satellite transmitters to the turtles and following their movements, the Duke scientists hope to answer some of these questions. After the tagging the turtles last fall, the scientists expected the turtles to head south for the winter. Well, hypotheses are not always correct, because these two turtles did completely different things—and neither one went south! One traveled far north into the North Atlantic, following the Gulf Stream. The other stayed in North Carolina waters for the winter. It seems that we have lots more to learn about sea turtle behavior! Collecting turtle data is not easy. The transmitters are scheduled to transmit latitude and longitude data to the satellites each time the turtle surfaces every day between 4 AM and 12 noon. Unfortunately, many factors can stand in the way of getting regular data including bad weather, rough seas, or lost tags. Any data that scientists do get will help them (and Signals of Spring students) to learn more about their mysterious ways.